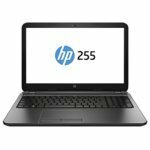 The 255 G3 is part of the HP range of laptops that strike a great balance between design, performance, mobility and productivity. Weighing at 2.19kg, the lightweight 255 G3 hosts a large 500GB hard drive with a 4GB memory for improved reliability and fast access to data. The integrated HP TrueVision HD webcam and digital microphone, means it’s easy to keep in touch with family, friends and colleagues. This entry was posted in Laptops And Tablets and tagged 15.6, 500GB, 8330, Black, inch, Laptop, Radeon by Computer Education World. Bookmark the permalink.